So far we’ve only eaten one meal out which is intentional. We purposely chose most of our accommodations to include a kitchen so we could cook. Eating out every day for 51 days would be impossible both physically and financially. And, since we both like to cook, it is fun to shop in a different environment. By now we have purchased a wide variety of French groceries and Norman has prepared many delicious meals for us. It is interesting to note that the quality of these products seems to be superior to what we have in the US. 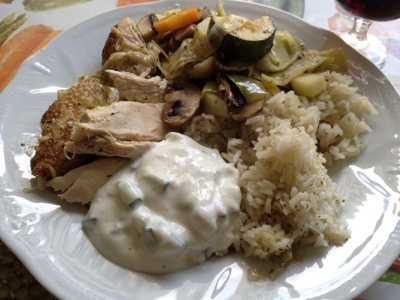 For example, yesterday we had chicken and potatoes prepared in a Dutch Oven seasoned with Herbs de Provence. The chicken was meaty but not fatty and flavorful throughout — even the breast meat was very tasty. There are several brands of fruit juices which are sold in tall, square cartons that contain at least 50% real fruit juice and they are delicious. We wanted a large container of plain yogurt and settled on the least expensive store brand of something called fromage blanc which turned out to be equivalent to Greek yogurt — very tasty by itself or served up with some fruit for breakfast or dessert. 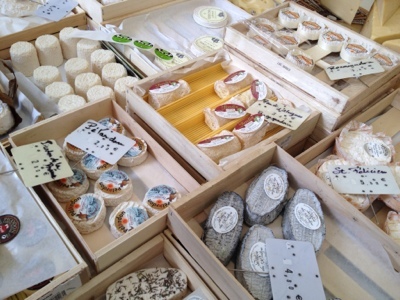 Of course, there are a few products for which France is especially renown like wine and cheese. As you might imagine, the selection of cheeses is overwhelmingly endless. Charles de Gaulle supposedly once asked, “How can you govern a country which has 246 varieties of cheese?” We have enjoyed a few kinds already and even the ones whose names we recognize seem much creamier and more flavorful than what we buy at home. Perhaps you might say that it’s just because we’re on vacation that everything tastes so good. In fact, the French go about the production of many of their foods in a manner that is no longer followed in the US where food production is driven by profit and quantity, not quality. The French still raise their animals on small farms where they can roam free and eat from the land. They call a pig a pig and a cow a cow — no special words for these when they come to the table like pork or beef. Cheese, like wine, is granted a certification that it comes from a particular region. This is the AOC label which stands for Appellation d’Origine Contrôlée and translates as “controlled designation of origin”. If you are a wine enthusiast, you are familiar with the concept of terroir which refers to the special characteristics that the geography, geology, and climate of a certain place bestow upon particular produce. The French apply this to many of their products including nuts, green lentils, and onions. Restricting a product to be made only in its region of origin limits production, but results in the quality that the French expect.